Study for Six Sigma Green Belt Foundation (level 1) with this fully accredited interactive, media-rich course that will introduce you to the Six Sigma methodology and equip you with the skills to manage, support and lead Six Sigma Transformation. You’ve reached the online center for Six Sigma Green Belt Foundation (level 1) training and certification. Our course has been accredited by The Royal Statistical Society and developed to provide students with a solid understanding of the key concepts of Six Sigma and of the pursuit of a Six Sigma organization. It will also equip you with the skills to manage, support and lead Six Sigma Transformation. You should take this course if you are responsible for supporting the success of Six Sigma or business improvement projects, or if your organization is considering applying the Six Sigma Enterprise approach. Browse the course syllabus for a full module by module breakdown of what’s included. With this course, you’ll receive 6 months access from the date of purchase as well as FREE 24-hour tutor support! This course is suitable for anyone who wants to gain an in-depth understanding of Six Sigma at Foundation level, including those who are new to the concept of Six Sigma but who are ambitious about learning and applying the Six Sigma principles and change management within their organization. There are no pre-requisites for learners wishing to complete the Six Sigma Foundation and Management Overview course. Why study Six Sigma Green Belt Foundation with 4PA? All 4PA courses run entirely over the web and have been carefully designed to provide the most comprehensive, interactive and flexible learning experience available. Study when it suits you – at home, at work or on the move. Flexibility to learn from your desktop, laptop or tablet at your own pace, when it suits YOU. Anytime. Anywhere (an internet connection is required). Our courses are easy-to-use. Students will benefit from an interactive multimedia environment that enhances the way you study. With eLearning, individuals and organizations avoid the typical costs of travel and consultancy by studying independently online. Our online training courses are designed with mobility and accessibility in mind. You can access your training from any desktop computer, laptop, tablet, or mobile phone. Six Sigma is a business management strategy designed to reduce defects and deviation. The principles mainly apply to manufacturing processes, although some would argue that the principles of Six Sigma can be applied in any workplace. Defects refer to things like wrong orders at fast food restaurants, scratches on a car finish, or products that are faulty. Deviations refers to undesirable variation around a target value for any aspect of a product – so for example, if a part is too big, too small, too light, too heavy, too light, too dark – these are deviations. Why Adopt Six Sigma for Your Organization? The aim of Six Sigma is to bring your production to the benchmark of no more than 3.4 defects per million parts. The data driven approach of Six Sigma is reliable, tested and proven over many decades. Through the use of data collection and statistical tools such as pareto charts, histograms, and fishbones, Six Sigma allows you to get a handle on the amounts of defects and deviations in your current processes. It then gives you ways to dig through the data, find the root causes, and improve processes so that these values improve in turn. The net effect of applying Six Sigma is to increase quality, and reduce running costs due to, for example, waste and rework. The course includes three multiple-choice tests and on successful completion, students will be awarded a Six Sigma Green Belt Foundation Certificate. Why not try a free trial module of our course before you buy! Browse the contents of this eLearning course by clicking on a module title below that you would like to know more about. Why not try a free trial module of our course before you buy! This module concentrates on the review and management of Six Sigma projects.Project management is a very big subject. It provides concepts, tools and techniques to manage relatively small projects, such as Six Sigma projects, through to mega projects like sending men to Mars. Ready to go through the Six Sigma Green Belt Foundation (level 1) assessment? On this page, you will find everything you need to know! Our Six Sigma Green Belt Foundation eLearning course is assessed based on the learning outcomes from the core modules in the course. There are no pre-requisites for learners wishing to complete this Six Sigma Green Belt Foundation course and if successful, you will be awarded a Six Sigma Green Belt Foundation Certificate of completion from 4PA. If successful, you will be awarded a Six Sigma Green Belt Foundation Certificate and will be able to confidently apply Six Sigma immediately in your industry sectors and be able to apply the knowledge and skills you have acquired straight within your organization. If you wish to take your studies further this foundation level will prepare you for Six Sigma Black Belt, which equips you with the soft and hard skills necessary to lead critical projects to successful completion. 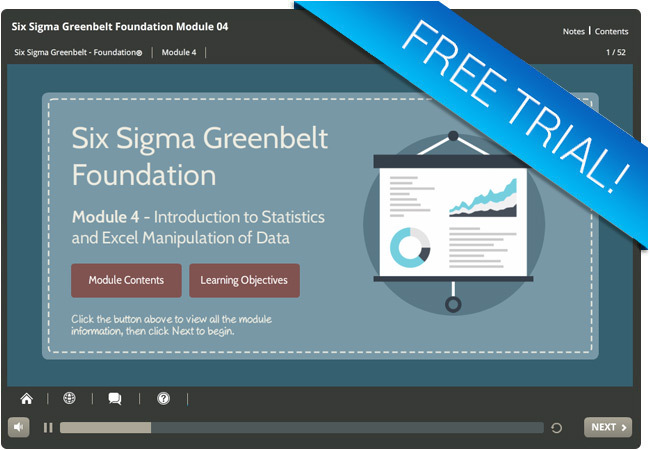 Why not try out a free trial module from our Six Sigma Green Belt Foundation eLearning course! In this Six Sigma Foundation trial module, you will learn how to achieve your Six Sigma Organization’s ultimate goal of using quantitative methods to improve processes to Six Sigma standards, via a mixture of interactive and audio techniques to enhance the learning experience. Like the full Six Sigma Green Belt Foundation eLearning course, you can access this free trial module from any device whether you are at home, at work, or on the move!